Cole: She is bare-faced, embarrassed, and she doesn't know. She thinks it's because of her. We see them so often... but what do the Dalish vallaslin designs represent? 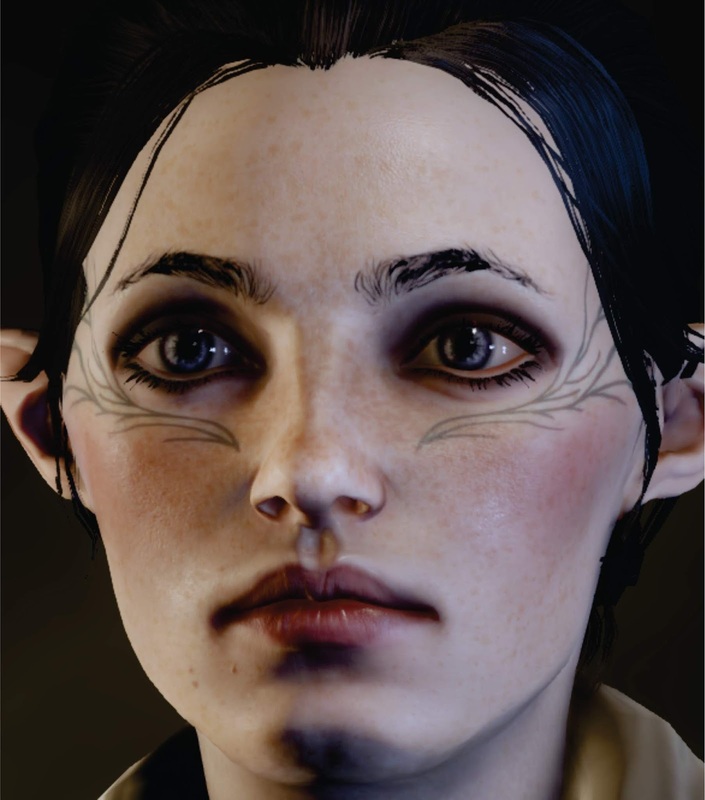 First off, let me state: I think or suspect Solas is being deliberately simplistic in the big "vallaslin scene" at Crestwood (also known as The Worst Date Ever). Probably deliberately so. He loves games, after all. Like: Yes, I think he's telling the truth. The vallaslins became slave markings. But were they always? Evidence suggests not. Codices and other references, to me, seem to imply that the vallaslins may have started as markings of simple allegiance, of tribute. 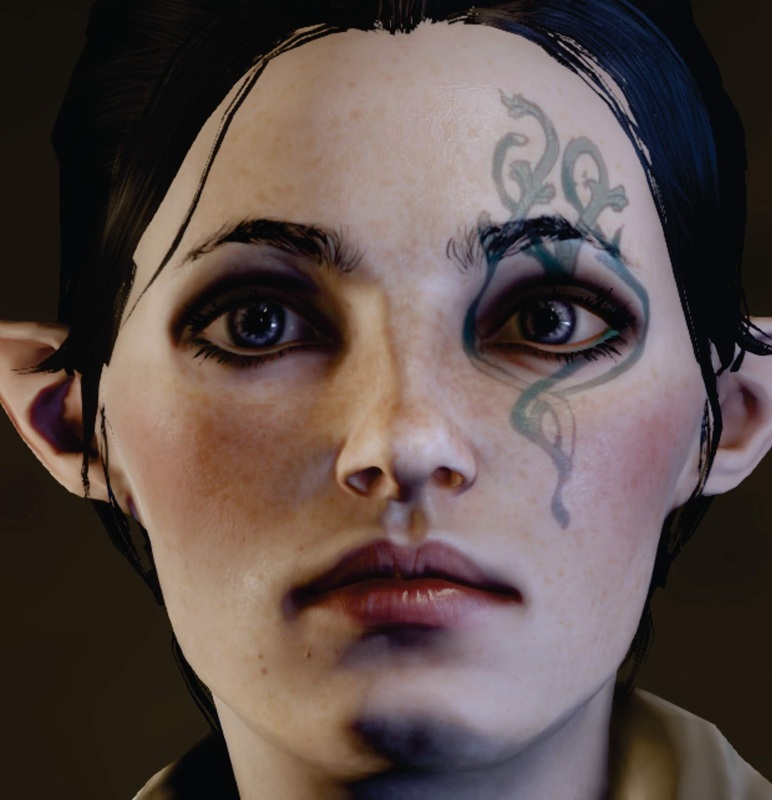 Which to me makes the idea of the vallaslins of Solas, Abelas, Ameridan, etc., a lot more believable. And which, to me, also ties with Legion of the Dead markings. I think they are linked: visibly. And ethically. Elves came first. But I also think those dwarven markings were, well, slave markings. DAMMIT ELVES. And as far as Solas, if we buy his scenario, it's pretty clearly canon (per Cole) that he had and then removed Mythal's vallaslin for love and later for ethical reasons. 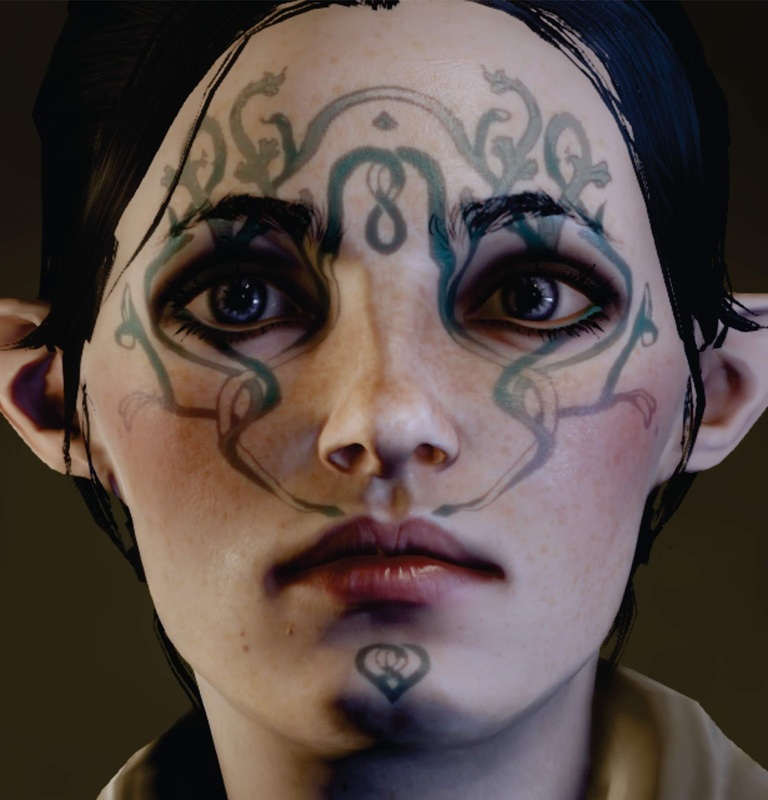 Which again fits Solas. Are there secrets to be found in their images and icons? 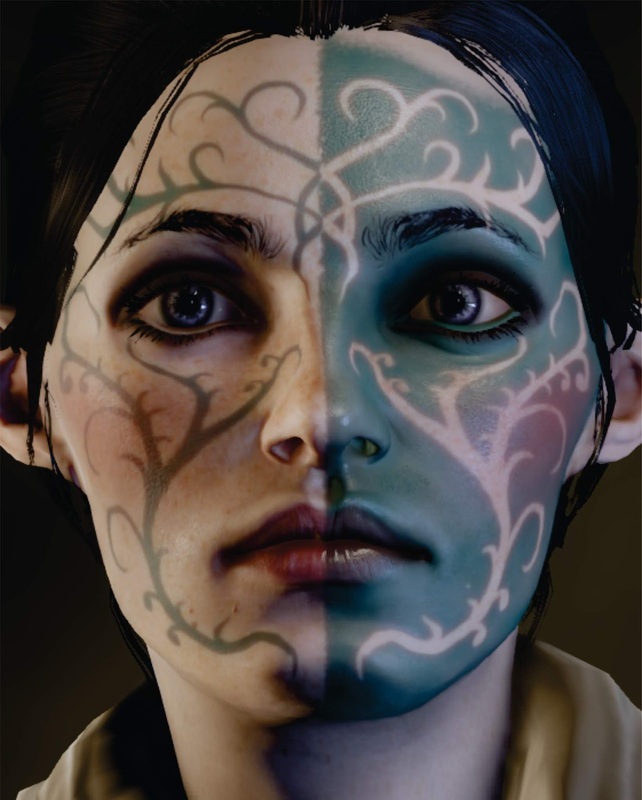 I've always wondered if they were simply beautiful abstractions or whether each vallaslin meant something else, tying the image to the god or goddess it represented. Me? I vote yes... there are secrets to be found there. 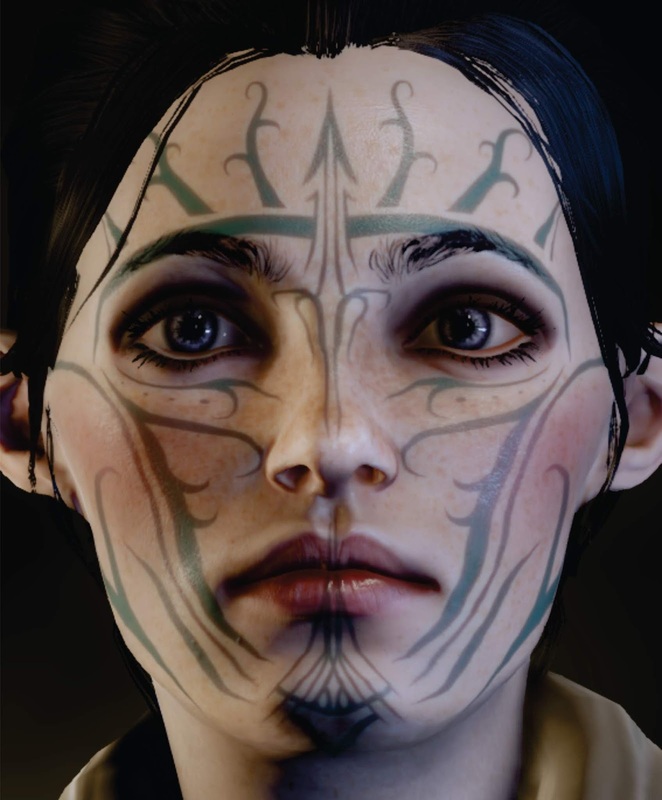 I definitely think we can see real images and symbolism in the beautiful lines of the vallaslin that correspond to the personalities and aspects of the Dalish pantheon. Here we go! 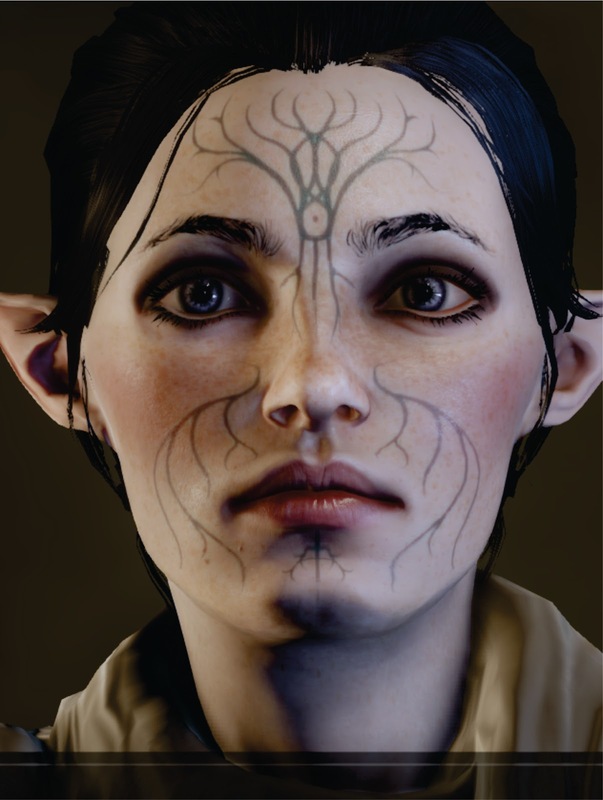 Mythal's vallaslin is a beautiful flowing of interlocking roots or veins that in the simplified versions either flower across the forehead alone or curve up each cheek like wings. The simplified "wings under the eyes" Mythal vallaslin is probably most famous among the fandom as that of incredibly talented fan artist Nipuni's "Solavellan" Lavellan character, Nalia. In the complex version, it flowers up like a tree from the nose across the forehead, with the "wings" connected and gracefully circling back around and beneath each eye. 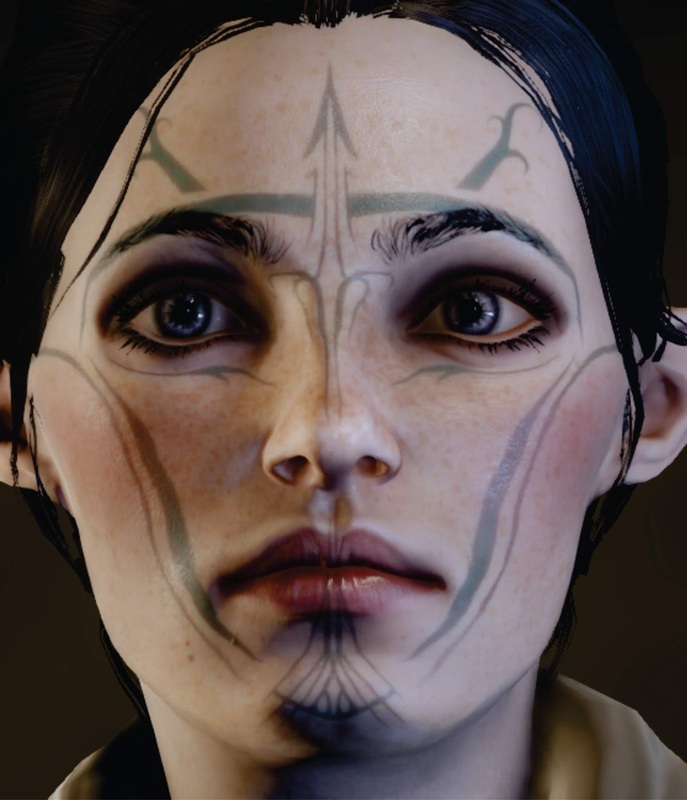 There's also a separate pattern on the chin that is almost a smaller, mirrored reflection of the forehead piece (and if you look closely, the two may actually be linked in canon, down across the nose, through the lips, and straight down into the chin piece. The most obvious interpretation of the chin aspect is of roots for the "tree" of the forehead. However, to me, if you look closely at Mythal's vallaslin, it's not just roots or branches, but an actual, highly stylized dragon, with the pointed head over the wearer's nose, and with the wings enveloping the eyes. In which case, is the chin pattern... the fire breathed by the dragon? Maybe. Most important of all, though, is (I feel) the idea of roots, of tendrils, of growing things. Mythal is not about abomination or tyranny but about growth, life. Elgar'nan's vallaslin variations are both interesting. The first is a bold, spiky interlocking series of branches almost like thorns that cover most of the face from chin to forehead. 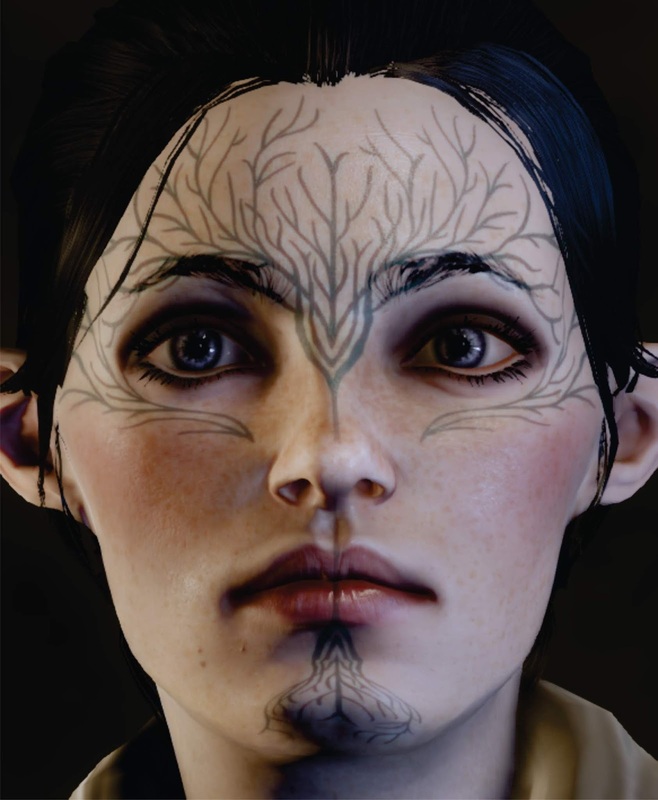 The more complex version includes this same, heavily graphical and thorny branch configuration, but then adds a deep, dark tattoo covering half of the face vertically, with the 'thorns' pattern reversed (uninked). To me, this is a clear visualization of darkness and light both literally (Elgar'nan was created out of the moment the sun hit the land), as well as figuratively (Elgar'nan was also violent and vengeful). There is even the slightest visual hint of forked lightning (another thing associated with Elgar'nan) as well here. As the God of the Dead, and one I've surmised may be an actual spiritual entity rather than a physical twin to Dirthamen, this vallaslin is interesting and suggestive. It's very clearly a tree (it almost looks like one of Fillory's clock-trees from Lev Grossman's The Magicians series), which to me is a clear evocation of the vallasdahlen, the life-trees planted by the Dalish on the graves of those who die. 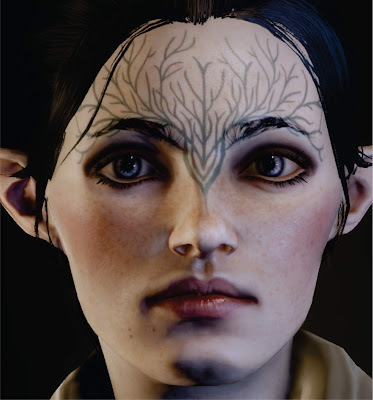 I also think there's a potential owl-shape in there on the forehead as well, in the very center of the tree, along with a hidden figure-eight symbol within the forehead-tree that may symbolize both eternity/infinity or The Fade, since circles in elven graphics seem to reference the Fade or Beyond. This could be significant since, as I've noted elsewhere, it's very possible Falon'Din was born a spirit, not a fleshly being (which would also explain his ability to travel to and from the farthest reaches of the Fade with ease). And speaking of the Fade, that circle with the dot at its center is undoubtedly an image of the Fade, just as a similar circle and dot represented the Fade on Solas's fresco on The Siege of Adamant. The central clock-tree element also strangely reminds me, just a little, of part of Solas's mural -- this time, the one that occurs after the Temple of Mythal. 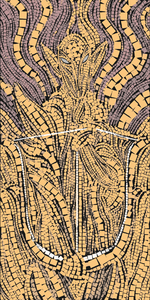 The rather spiky, stylized figure there is meant to represent Abelas. The "tree" here could almost be a similarly spiky figure, arms outstretched. Or perhaps I am again looking far too closely! 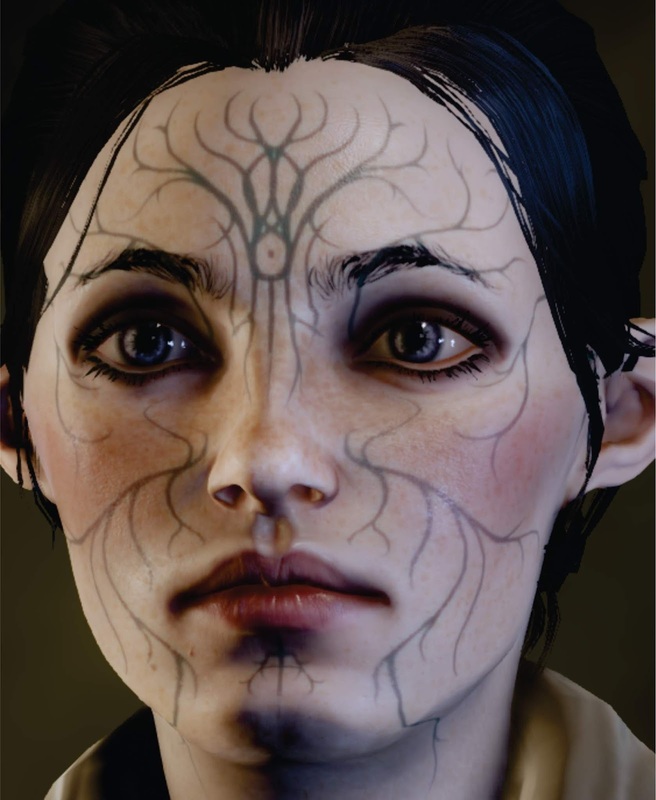 Meanwhile, the alternate Falon'Din vallaslin features those tendrils that reach toward the eyes, cheeks, neck, hairline, and around the eyes. Symbolizing the inexorability of death? Or of dreams? As the Keeper of Secrets and Master of Ravens, as well as the god of Knowledge, Dirthamen's is fascinating because it's one of the easiest to parse -- the forehead graphic is fairly obviously a very stylized raven in flight (Dirthamen famously had two ravens that he mastered, Fear and Deceit). If you look closely, you can see the head and "beak" of the raven stretches down across the nose, with the wings arched back in flight on the forehead. Or... if you interpret differently, are the "wings" arched back on the cheeks? I do think either way, that this is a bird in flight. And look at all the downward-facing triangles! Are the triangles symbolic of secrets? Is that what all the countless downward-triangles may signify on the many frescoes we witness across Dragon Age: Inquisition and "Trespasser" (and now, in the new #TheDreadWolfRises teaser)? I love Andruil's and it's so easy to figure out too, since it's a big, honking, giant bow right in the middle of the wearer's face with the readied arrow pointing up. Yet. The more complex version of Andruil's vallaslin, with its branching, flowing lines, could actually also reference the Vir Tanadhal, the Way of Three Trees. And those flowing 'rays' meanwhile that we see emitting from the bow in the complex version to the left -- I think these are another representation of the squiggly lines or "rays" we previously witnessed on Andruil's mosaic in the Temple of Mythal. As for me, I think they may symbolize instability, insanity... or Blight. 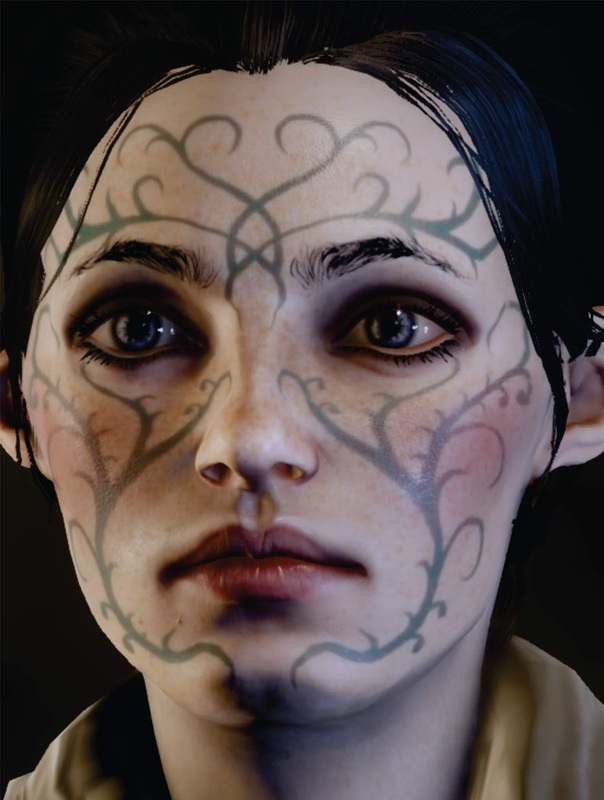 As the provider of fire, rope, and herbs among her gifts, Sylaise's beautiful simplified vallaslin looks to me like the curling smoke from a flame, which would be fitting since she brought fire to the people. The intertwining curls could also be a subtle reference to a graceful growing herb, as well—appropriate to her identity as a kind of spring or fertile goddess figure. The more complex version, meanwhile, turns these curves into a few very clear yet intertwining ropes or vines, some of which actively appear to be budding or flowering. These "vines" are leafier than those of the other gods, and are also multiple shades from light to dark. There's also something almost "dragonlike" about the vines at the top of the forehead, but I could be reading too much into things there (I usually do!). First off, this one's notable as it's one of the only ones to go all the way down the neck of the wearer. To me, it's stylistically very evocative of the Legion of the Dead tattoos among the dwarven people -- could this be a hidden clue to add to that growing list that the lives of dwarves and elves in ancient times were intertwined? After all, June is the god of crafts and weapons (I'm picturing a very Hephaestos-like figure)... both beloved of the dwarves (especially those "fine dwarven crafts... direct from Orzammar!"). Even his mosaic in the Temple of Mythal includes a huge anvil glowing right before his figure. And yet it's also implied he didn't just craft weapons... remember the Anvil of the Void questline with Caridin in Dragon Age: Origins? What if June's was something similar -- but far more powerful? What if he actually forged... people, like Caridin? The dwarves themselves? The rest of June's design could be seen as being a skeletal tree with roots, but to me the entire shape and the repeated curving lines at the forehead are reminiscent of armor, and specifically, of a faceplate. I love how the interlaced lines across the forehead actually evoke the lines of an armored visor. And the strong vein that runs down the neck isn't plantlike to me, so much as veiny or blood-like. To me, it may represent heart's-blood. 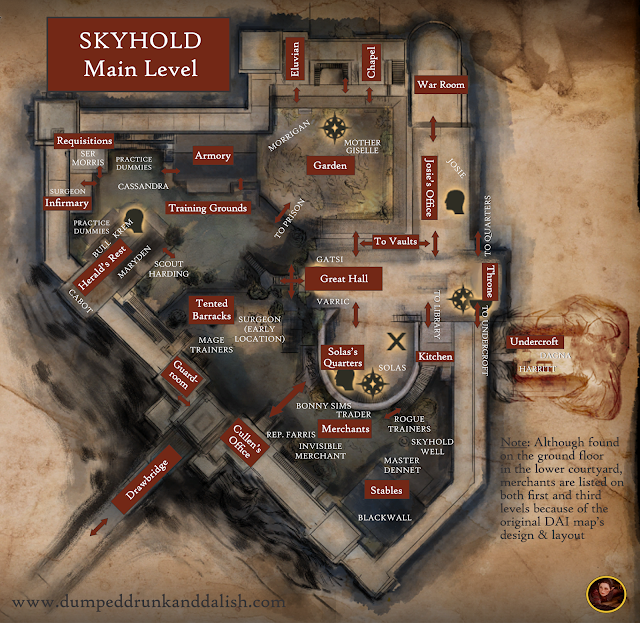 Or, the blood of the stone... lyrium? Here we find one of my favorite vallaslins, the lyrical and stylized, flowing diadem that is a gorgeous abstraction of a halla head and its branching, flowing horns. 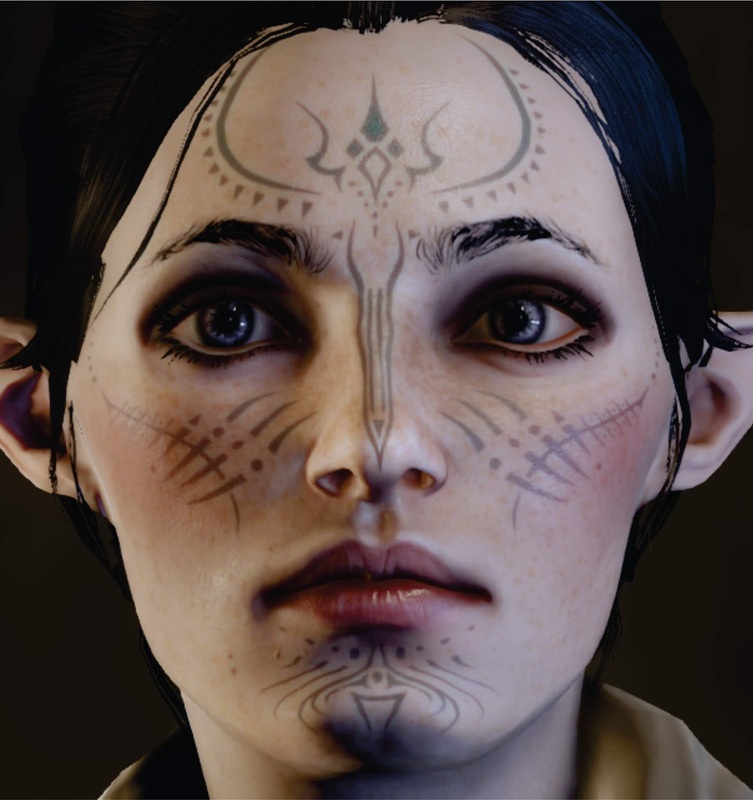 It's a very pretty and delicate vallaslin, and it's usually my favorite for my Lavellan Inquisitors. 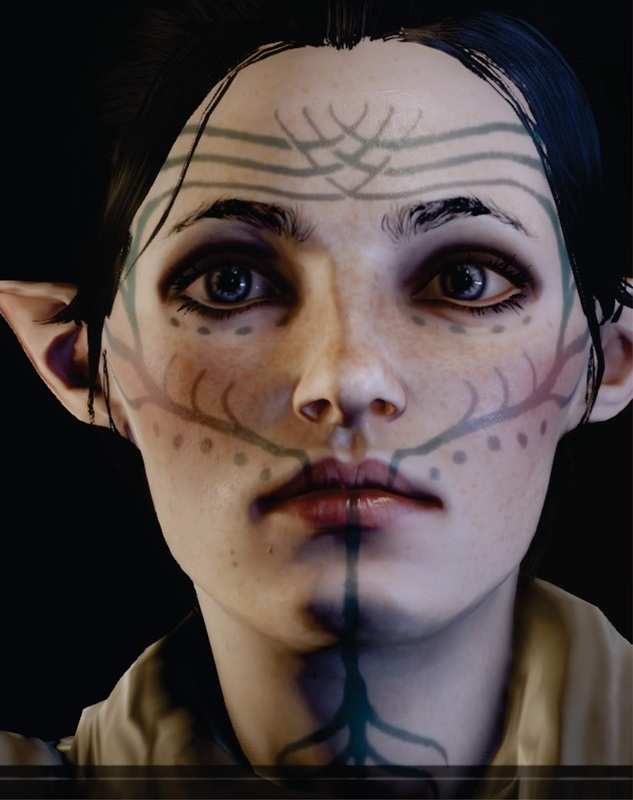 I used to choose it because I loved the look of it, and I felt that Ghilan'nain was among the gentler of the Dalish gods. Of course, after heavy research on my part, I'm not entirely sure this is true. But I was so much younger then, a sweet summer child who had no idea that I'd eventually be one of those people who uses elven swear words or who is still microanalyzing everyone's dialogue for clues. But that's Dragon Age for you! Meanwhile... what do YOU think the vallaslin symbolize? What have I missed? 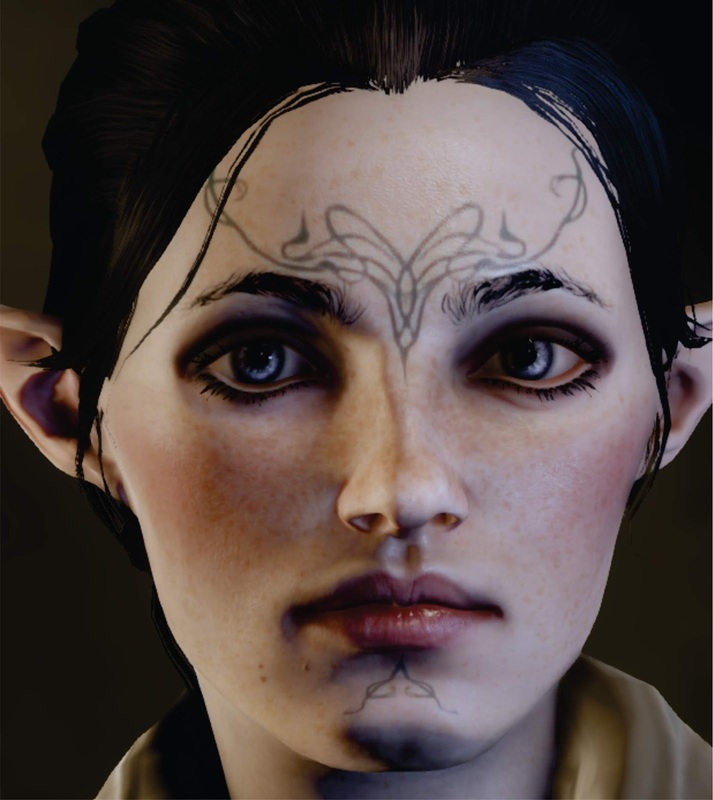 It's really interesting that June's vallaslin goes down the neck. Does it look to you very similar to the lyrium tattoos of Fenris and that this vallaslin might have once also been across the entire body and infused with lyrium for those serving June (willingly or not)? As you suggest, a literal forging of an elven warrior with lyrium.